Cornstarch, or cornflour (makkai ka atta), is the starch of the maize grain, commonly known as corn. According to Dee Anna Glaser, MD, associate professor of dermatology at St. Louis University school of medicine, Cornstarch is one of the best home remedies to prevent irritated skin, as it relieves chafing by forming a protective absorbent layer between you and the outside world. With less friction, the irritation lessens when the skin rubs against itself or something else. Dr Glaser further says that you can also reduce the amount of moisture that normally develops over the course of a day by sprinkling odor-prone areas with cornstarch. This ingredient is probably sitting right there in your kitchen pantry and if you had always used it only in your food recipes, it’s time to think of using it as a beauty aid. Here are some remarkable cornstarch (cornflour) beauty recipes. Combine the ingredients; add water to make a paste of smooth consistency and apply on your face and neck. Allow it to dry for 15 minutes and then wash off. A great mask for oily skin and in summers. Though this flour appears quite powdery and smooth, it is slightly abrasive as well; and hence can be used to slough off dead skin cells. Combine all the ingredients. Massage it into your skin and rinse with warm water. Mix the two to make a paste and apply on the area for 15-20 minutes; remove it off with a moist cotton ball and rinse off with warm water, this helps to get rid of blackheads/whiteheads. When you are traveling or don't have time to take head-bath and find that your hair has become greasy, dull and lifeless, you can use cornstarch as a dry shampoo. Just sprinkle some cornstarch all over your scalp, wait for a few minutes and gently comb through it. Cornstarch soaks up the excess sebum from your scalp and invigorates your lifeless locks. Also go though these remedies for dull, limp hair. You can also try this instant tip to make greasy, limp hair look better. If you're having a hard time getting your hair untangled, dust some cornstarch over your tangled hair and gently comb it. Cornstarch is a natural detangler and as you comb out your hair, the tangles will resolve. Read these tips on how to detangle hair if your hair gets tangled after a shampoo or otherwise. Combine all the ingredients. Add 2-3 tsp of this mixture to the water in your bathtub before you soak in it. In summers it is quite common to have sweaty and smelly feet. Just sprinkle a little corn flour on your footwear before you put them on. As cornstarch absorbs moisture, it will keep your feet perspiration-free and odor-free to a great extent. As suggested by Dr Glaser, you can mix a pinch of baking soda with cornflour and pat it on your underarms to keep them dry and odor-free during the hot summer days. Also go through remedies to cure itchy, irritated & burning underarms. Normally if we want to give a matte effect to our lipstick, we tend to dust some talcum powder to our lips and then apply one more coat of lipstick. Instead of talc, we can make use of cornstarch. Apply a layer of lipstick and then dip your finger in some cornstarch and smear it over your colored lips. After dusting off the excess, reapply your lipstick to give a matte effect. An easy way to get matte effect for your nail polish is to add a pinch of cornstarch to it, mix it thoroughly and apply it on your nails. However don't put the cornstarch inside the bottle itself; mix it outside in some clean dish and then apply. 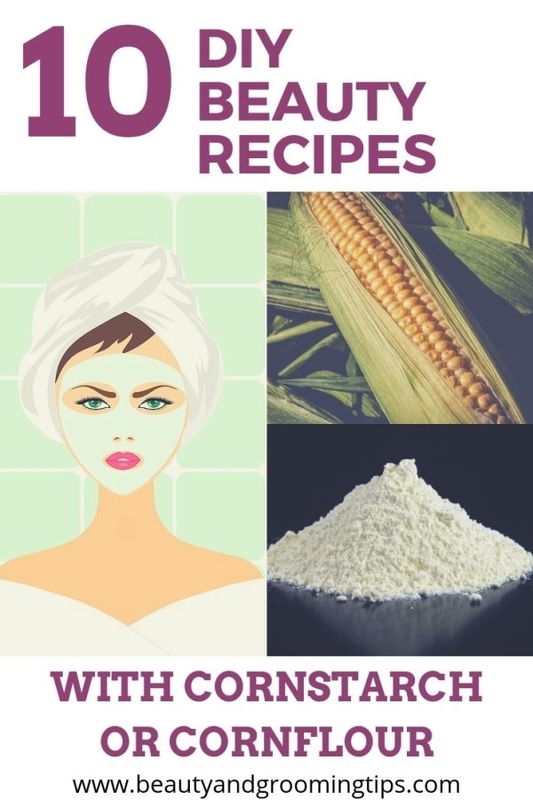 So have you tried some of these DIY beauty recipes with cornstarch? Do you know of more ways of utilizing cornstarch or cornflour in your DIY beauty aids? Do share in your comments. Some great recipes here. We have featured your article in our latest Bits of Beauty carnival. You have a great blog. These recipes worked for me. Thanks a lot. I am making a banana mask every week! Half of a banana put in a blender for several secs and there you have it! The mask is awesome, the skin literary starts to glow! Face is the index of our mind...we ll should take care of our face. Liquid milk' is very useful for brightening skin. Message ur skin daily by liquid milk in right way. U ll feel the diff with a few days. It's a lot easier to get cornstarch in the Cans. I don't know about making cornstarch.. I assume it's like making cream of wheat except you dry it out afterwards but I could be wrong!. Cornflour can be used for many things from cereal to Veggie burgers! I often make golden nuggets using corn flour and pancake batter!. U can make a pancake batter using corn flour. Corn flour is one of the most versalite flours next to All purpose flour! Most spots that call for all purpose flour you can use cornflour instead! I'm always running short of cornflour! Soothe sensitive skin by gently dusting cornstarch on it! It helps relieve pain, itching and discomfort by soothing skin.